HOUSTON, July 11, 2018 /PRNewswire-USNewswire/ -- Severa Parrish could have a life of 'what ifs.' What if her military career had continued? What if she had been the Marine to die in a helicopter crash in Iraq? Instead, Severa found hope, help, and fellow veterans to lean on through Wounded Warrior Project® (WWP). Severa joined the U.S. Marine Corps in 2000, in part to honor her deceased father. She immediately enjoyed the camaraderie that comes with serving alongside other Marines. But in 2004, a squadron helicopter crash left Severa asking questions. A fellow Marine – a husband and father – died when the enemy shot a helicopter down. When the helicopter and that Marine did not return, Severa was left wondering why she could not have taken his place. "Why him? Why not me? He had a daughter who he'll never see grow up. It should have been me instead." Severa has dealt with this survivor's guilt for 12 years, struggling with feelings many survivors feel following a traumatic experience. Severa also sustained a traumatic brain injury (TBI) and lives with the symptoms of post-traumatic stress. "When I first got home, I thought I was OK. I didn't go get help." But she wasn't OK. Severa retreated from the everyday world as her night terrors and angry outbursts became more common. Then she learned about WWP. "They helped me in many ways. There is a connection in my healing process. As I heal and progress, my relationships with friends and family improve." One of the ways WWP helped Severa heal is through a mental health workshop. She participated in the very first one dedicated to all-female warriors. "We went through different challenges and learned to work together to adapt and overcome. We went horseback riding, bicycling, rappelling. "You have the same camaraderie you had when you were in the service." What if she hadn't gone on that mental health workshop with Wounded Warrior Project? She did, and she is stronger for it. 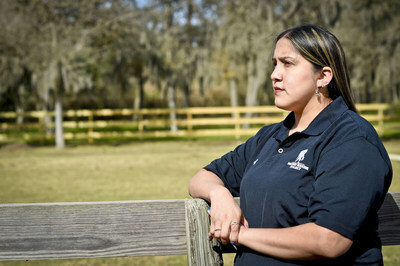 Read more about Severa at https://www.linkedin.com/pulse/wounded-veteran-finds-hope-wounded-warrior-project.